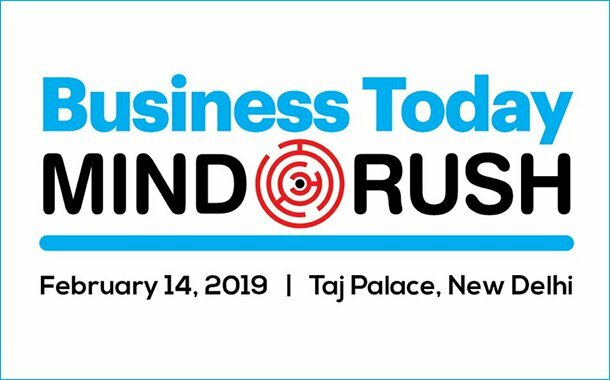 New Delhi: Business Today will host the 6th edition of Business Today Mindrush – India Today Group’s annual flagship business event on February 14, 2019 at The Taj Palace, New Delhi. Rebrain or Rot is the underlying theme of this annual flagship business event. The conference flow is designed to bring together industry experts and thought leaders with the objective to shape the agenda of Indian enterprise. The sessions will also provide an opportunity to engage with political & business leaders, academicians, opinion makers and motivational speakers. The Master Classes by international domain experts will lend the audience an in-depth understanding on the new trends and best practices shaping the global business milieu. In this edition, Futurist, Algorithmic Leader & CEO – Tomorrow, Mike Walsh, will be leading the Master Class on ‘The Top Trends Shaping the Future of Business’ and internationally renowned coach & trainer David Wood will be leading the Master Class on how to amplify your productivity and output. The sixth edition of Business Today Mindrush will be graced by Shri Nitin Gadkari, Union Minister for Road Transport, Highways, Shipping & Water Resources, River Development & Ganga Rejuvenation as the power keynote speaker. Other powerful opinion makers include Montek Singh Ahluwalia, Economist and former Deputy Chairman of erstwhile Planning Commission of India; Rajat Kathuria, Director and Chief Executive, Indian Council For Research on International Economic Relations (ICRIER); Sanjeev Sanyal, Economist, Author, Urban Theorist and Principal Economic Adviser, Ministry of Finance, will deliberate on the Future of Business in India and share their insights. The day-long event will have various sessions on industry related challenges and the future of business by industry stalwarts and power speakers like Peter Betzel, India CEO, Ikea; Janmejeya Sinha, Chairman (India), Boston Consulting Group; CP Gurnani, Managing Director and CEO, Tech Mahindra; Patu Keswani, Chairman and Managing Director, Lemon Tree Hotels; Rajesh Magow, Co-Founder and CEO, MakeMyTrip; Neha Kant, Co-Founder and Director, Clovia; Alok Bansal, Co-Founder and CFO, Policybazaar; Lula Mohanty, Managing Partner, Global Business Services, IBM India/ South Asia ; Dr Gautam Shroff, Vice President, Chief Scientist and Head of TCS Research, TCS; Bhaskar Bhat, Managing Director, Titan Company Ltd; and Shyamal Mukherjee, Chairman, PWC India. The event will culminate with Business Today Best CEO awards ceremony which felicitates and recognizes trendsetters from the corporate world. The CEOs will be evaluated under 13 categories based on their business’s growth, success stories and how they have empowered the nation in the process. .